Use as AV cart, coffee station or fax/printer stand. Lightweight yet heavy-duty plastic cart with three shelves. Built-in UL Listed three-outlet power strip, 15-ft. cord and winding bracket/molded handle. Four 4" casters, two locking. Use as AV cart, coffee station or fax/printer stand. 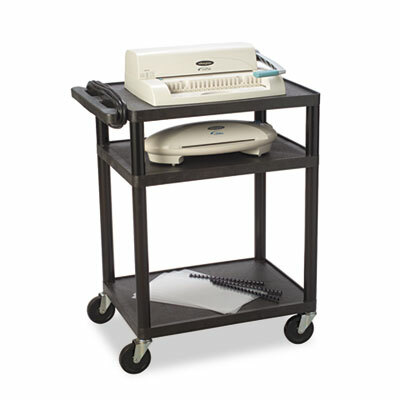 Lightweight yet heavy-duty plastic cart with three shelves. Built-in UL Listed three-outlet power strip, 15-ft. cord and winding bracket/molded handle. Four 4" casters, two locking. Capacity (text) Capacity: 300 lbs. Adjustability Height at 27" or 42" or 48" or 54"
Adjustability Height at 26" or 34" or 42"